Many grandparents envision RVing with their grandkids as an ideal way to spend quality time together. But how do you handle teens who are glued to their mobile devices? What do you do with younger children who don’t like hiking or eating semi-charred hot dogs over an open fire? 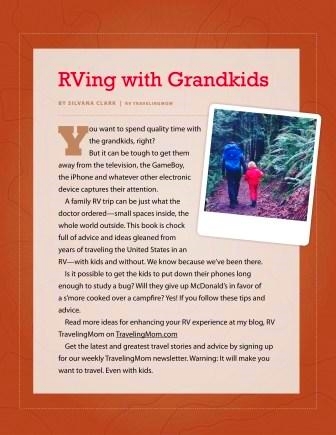 Get all the tips and creative ideas you need from the just-released eBook, RVing With Grandkids. This free resource helps grandparents, (or any adult RVing with kids!) have all the resources they need to create wonderful, outdoorsy memories. Going camping for the first time? Wondering if you should take the family pet? Want some ideas on keeping kids engaged while hiking? Need help with indoor activities if it rains? No worries! RVing With Grandkids is your one-stop resource for anything RV-related. There are even suggestions on what to do if you don’t own an RV.